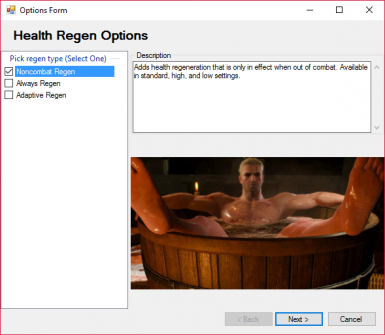 Adds different health regeneration options depending on user preference. 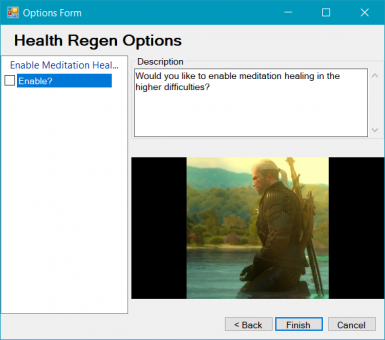 Adds health regeneration when out of combat so that you do not need to eat food or use swallow to refill your health in higher difficulties, where meditating does not heal. Available in extreme, high, standard, low and lowest settings. 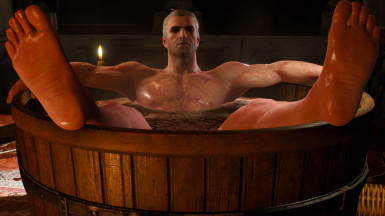 Adds health regeneration that is always in effect whether the player is or is not in combat. Available in extreme, high, standard, low and lowest settings. Adds health regeneration that is lower in combat, while higher out of combat. Available in high, standard, low and lowest settings. Allows you to enable meditation healing in higher difficulties. Install with Nexus Mod Manger if you are using the Installer! 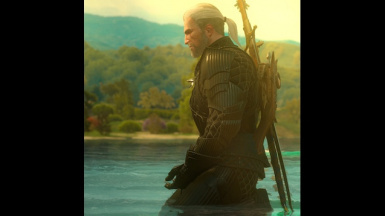 If you are downloading an individual file you may copy and paste the modhpregen folder to the mods directory at The Witcher 3 Wild Hunt\Mods. Most incompatibilities can be fixed by using Script Merger. Install both of the incompatible mods and open script merger, click on the top most check box on the left side, click on the merge selected files box on the bottom-most left hand side and it will automate the merging process, afterwards both mods should work.